A popular seafront café in Ferring is proposing to expand by building a new two storey annex. Peter Garrett, owner of Bluebird Café in The Strand, said the extension was necessary to accommodate the increasing demand at the café – where he said customers frequently end up queueing out of the door. The extension will double the amount of internal seating at the café as well as allowing for a larger food preparation area and more serving counters. Mr Garrett said work to update the café, which has been in the Ferring community since 1927, was long overdue. “We need to evolve. We want to prepare ourselves for the future,” he said. The proposed expansion would see the existing outdoor seating area enclosed and a terrace built ontop which would have ‘uninterrupted sea views’. The extension, which would have full disabled access, would also create a multi-purpose event space which Mr Garret said could be used for free by local charitable organisations, such as the Ferring Country Centre. Mr Garrett, who has run the café for 23 years – though the business has been in his family for more than 40 years, said he was passionate about the redevelopment and hoped the ‘beautiful design’ would help make the most of the café’s fantastic and unique location’. 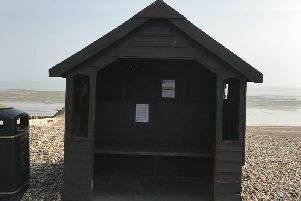 He added that he was in talks with the owners of the car park and with Arun District Council to improve the car park, and in discussion with the council and with Ferring Parish Council to improve the nearby public toilets. A planning application has been submitted and Mr Garrett said a couple of public meetings had been held with the community. Mr Garrett said of the feedback received so far: “The majority of people are really excited about it and are up for it. Find out more about the expansion plans here.